Backed by huge industry experience and market understanding, we are involved in offering a wide array of Junior Hexa Frame for our valued patrons. - Used for cutting wooden boards. To cater the different needs of our precious customers, we are highly engrossed in providing a wide range of Hacksaw Frame Fixed. Being one of the renowned firms in the industry, we are decidedly involved in providing a premium quality array of JuniorHacksaw Frame. Strong Steel Handle, Supplied with 300mm Blade. 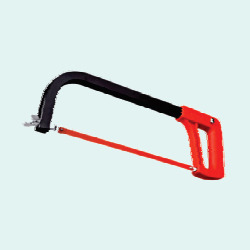 Synchronizing with the advancements taking place in the industry, we are engaged in providing Folding Hacksaw Frame. By keeping track of the emerging needs, we are engaged in manufacturing and supplying an exclusive range of Junior Hacksaw Frame. A hacksaw is a fine-toothed saw, originally and principally for cutting metal. They can also cut various other materials, such as plastic and wood. • Supplied with or without 12" (300 mm) Carbon Steel Blade. • Rigid and well balanced frame made from Tubular Steel. • Available with and without Blades.